Garden is a primary biome type characterized by grass and pine trees. Garden planets are a 'low' threat level, geared toward tier 1 in progression. They are the first planet type players will encounter when beginning a new game, and feature the weakest monsters of any planet type. Garden biomes can be created and expanded using a Lush Terraformer, and a planet will convert to a Garden planet once half of the planet's surface has been terraformed into Garden biome. Garden planets can only be found orbiting gentle (white) star types. There are no environmental hazards in garden biomes which require use of an environmental protection pack. Gardens replace a similar biome, Grasslands, that used to exist in beta versions of Starbound. Gleap, Poptops, and Nutmidges have a chance of being found in garden biomes. Garden biome planets can be identified by the keyword Lush in their navigation console description. Lush foothills mark this landing location. Both flora and fauna are abundant here. A beam site of immeasurable safety. The beam site is located in a tranquil area of great bio-diversity. There are resources here that you could use. A lush and pleasant land. Readings indicate the landing site is not unfavourable - the area is safe, and lavish with both flora and fauna. A lush and hospitable place. The surface layer of gardens is primarily made up of dirt, cobblestone, and mud. There's an abundance of gatherable wood because of the plentiful trees. The planet's primary color in the navigation console and while orbiting above is the primary color of the dirt found there. Most common early game ores are found in garden biomes, with of copper, silver ore, gold and iron available near the surface. Garden biomes use the Day Tracks during the day and the Night Tracks during the night. The only sub biome which can be found on garden planets is forest. When forest appear they'll include things like their associated blocks, trees, and crops. Gardens can also be found on a number of different planet types as sub biomes. They have a chance of being found as sub biomes on forest, desert, savannah, snow, jungle, toxic, mutated, midnight, or decayed planets. Garden biomes have no minor biomes. However, Garden planets can have forest mini biomes like spring or mushroom patch inside forest sub biomes. Garden planets have a much more consistent layer composition compared to other non-Barren planets. Garden biomes use 2 kinds of night terrors, 1 kind of small passive biped or quadruped, and 1 kind of small passive flying creature. In addition to procedurally generated creatures, there are a variety of unique monsters, bugs and critters found in garden biomes. Some of these are also found in other biomes, while others are unique only to garden biomes. While these unique creatures have a chance to appear on garden planets, they will not all appear on each one. In addition to unique creatures, each biome has multiple types of both procedural ground and flying creatures. Garden biomes have no exclusive costume sets, but there are a selection of cosmetic hats which can be found in Pod Chests. Commonly chests will contain plant fibre, timber, salves or bandages. An ancient gate found on a garden planet. Garden biome planets always have two settlements on them. A camp, where there's an entrance to a mine dungeon as well as an ancient gate which leads players directly to the outpost after it's been initially repaired using core fragments. 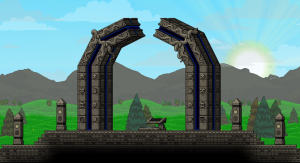 Each garden planet has an ancient gate which players can use to travel to the outpost when they first encounter it. In order to use it initially they'll be tasked with gathering 20 core fragments. No villages appear in Garden biomes. Mines are the only dungeon type which appears on Garden planets.